Well-written case studies can be a real boon to your website or marketing print arsenal – they show you know your onions, and demonstrate your skill set to potential clients. Recently we wrote this case study for business coach Nigel Scott of ActionCoach in Marlborough. “My mantra is that entrepreneurs should take time to work on their business, as well as in their business,” says Nigel. Nigel and Tom work together every couple of weeks, and have a monthly face-to-face meeting. The appointments give Tom time to stop and think about his business. For Tom – who studied economics at university, but eschewed an intended life in The City to return to the countryside, and his family’s 150-acre farm – Nigel has been a valuable mentor. “I came into an industry I knew nothing about. I didn’t know good business practice, or how to be a good boss,” admits Tom. “Nigel has made me realise what I can achieve, and I’m reassured that what I’m doing is basically the right thing, but I’m finding ways to make it manageable. To ensure that the whole team – which had rapidly expanded from five in 2008 to 35 by 2014 – shared a vision for the business, Nigel helped Tom draw up a set of Purposes and Values, which guide the company and are used to recruit and develop new and existing staff. 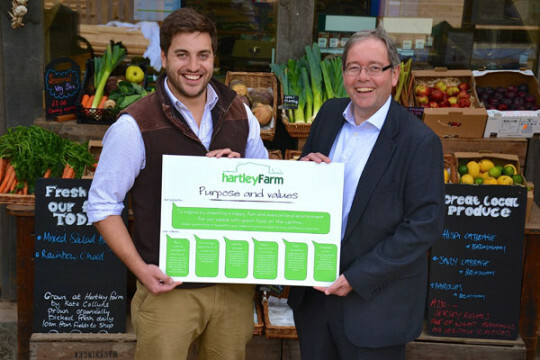 Nigel was determined that Hartley Farm should get some awards under its belt, to give the business local and national recognition. As a result, the business now has 15 awards to its name, including some coveted Taste of the West Awards. And the whole thing is paying off: turnover is expected to increase by 15 percent in 2014, not including the extra revenue that will be generated by Little Hartley Farm when it opens. This entry was posted in Business, Case studies, Client news, Marketing tips, Secret Agent Marketing and tagged ActionCOACH, Case study, Hartley Farm, Nigel Scott. Bookmark the permalink.